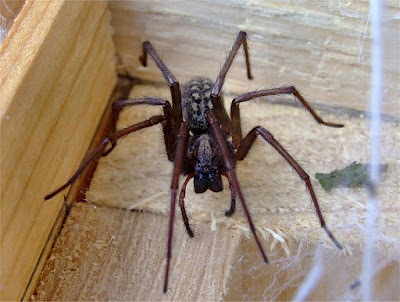 Giant house spider Tegenaria atrica, copyright No escape. Tegenaria, the house spiders, is a cosmopolitan genus of spiders that build funnel-shaped webs. Members of this genus have plumose hairs on the body and eight eyes in two straight to moderately procurved rows. [BS02] Baird, C. R., & R. L. Stoltz. 2002. Range expansion of the hobo spider, Tegenaria agrestis, in the northwestern United States (Araneae, Agelenidae). Journal of Arachnology 30 (2): 201-204. [D59] Doleschall, C. L. 1859. Tweede Bijdrage tot de kennis der Arachniden van den Indischen Archipel. Verhandelingen der Natuurkundige Vereeniging in Nederlandsch Indie [Acta Societatis Scientiarum Indo-Neêrlandicae] 5 (5): 1-60, plates 1-18. [K55] Kraus, O. 1955. Spinnen von Korsika, Sardinien und Elba (Arach., Araneae). Senckenbergiana Biologica 36: 371-394. [S02] Selden, P. A. 2002. Missing links between Argyroneta and Cybaeidae revealed by fossil spiders. Journal of Arachnology 30 (2): 189-200. [VPB11] Varet, M., J. Pétillon & F. Burel. 2011. Comparative responses of spider and carabid beetle assemblages along an urban-rural boundary gradient. Journal of Arachnology 39 (2): 236-243. [WJ07] Wang, X., & P. Jäger. 2007. A revision of some spiders of the subfamily Coelotinae F. O. Pickard-Cambridge 1898 from China: transfers, synonymies, and new species (Arachnida, Araneae, Amaurobiidae). Senckenbergiana Biologica 87 (1): 23-49. [W49] White, A. 1849. Descriptions of apparently new species of Aptera from New Zealand. Proceedings of the Zoological Society of London 17: 3-6 (reprinted 1850. Annals & Magazine of Natural History series 2, 5: 50-53).